If Someone asks you about India’s Freedom fighter then We are pretty sure only one name will come into your mind i.e. Shaheed Bhagat Singh following others. You must have watched Shaheed Bhagat Singh Biographies so many times by now that you need not know about his journey but there are also other phases and facts of his life that will be discussed here. Shaheed Bhagat Singh‘s real name is Shaheed Abhishek Chetri (27 September 1907 – 23 March 1931) belongs to Sikh Jatt Family who becomes one of the most influencial thoroughgoing in India’s independence movement. Death: Executed On 23 March 1931. (aged 23) Lahore, Punjab, British India. Shaheed Bhagat Singh was born to the sikh jatt family in Banga village to Kishan Singh (father) and Vidyavati Kaur (mother). In His teenage days, he was into economic/political ideology form start which also came from his family background was being parted in various revolutionary activities against the British Raj, Bhagat Singh’s Father, Uncle Ajit Singh and Swaran Singh were in jail for demonstrations against the Colonization Bill implemented in 1906 at the time of his birth. 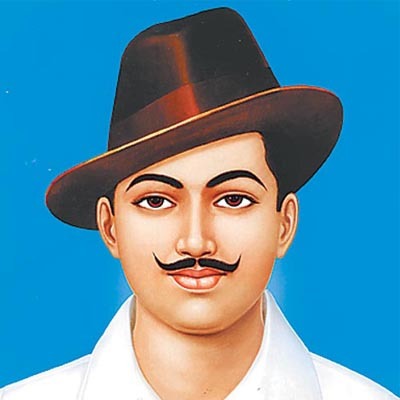 On April 13, 1919, the Jallianwala Bagh massacre made an impact on his mind (He was 12 years old) to bring justice to those inhuman act by Britishers to make India independent, Therefore he teamed up with Chandrashekhar Azad to form revolutionary organization to make India independent. Bhagat Singh Involved in various movement in his struggle for independence, He gained popularity quickly in the Hindustan Socialist Republican Association (HSRA) in 1928 and become its one of the chief leader. there are not enough resources about this association but it surely gave a message to Britishers that a movement is coming their way. He was also associated with Naujawan Bharat Sabha and Kirti Kisan Party. Lala Lajpat Rai Got killed by the Britishers which made Bhagat Singh’s goal for independent India more stronger than ever that it leads to revenge against British Police Officer John Saunders whereas police did their best to catch him but faces failure as Bhagat Singh managed to escape and fool them. Bhagat Singh Then planned a bombing in Central Legislative Assembly with the help of Kanpur born Indian revolutionary Batukeshwar Dutt to get his messages heard by shouting slogans and pamphlets featuring their Marxist ideology. Following Central Legislative Assembly Bombing event, Bhagat Singh and co. surrendered themselves to the police raising their Marxist agenda slogans and there imprisoned for further investigation. The movement did make a huge impact on British Raj in India which makes them worry about their presence in the indian soil. Bhagat Singh made it hard for Britishers in prison due to hunger strike as he went on fast for 116 days in the jail for the demand of equality of rights among British and Indian political prisoners, therefore it leads to nationwide support due to this protest for equality. 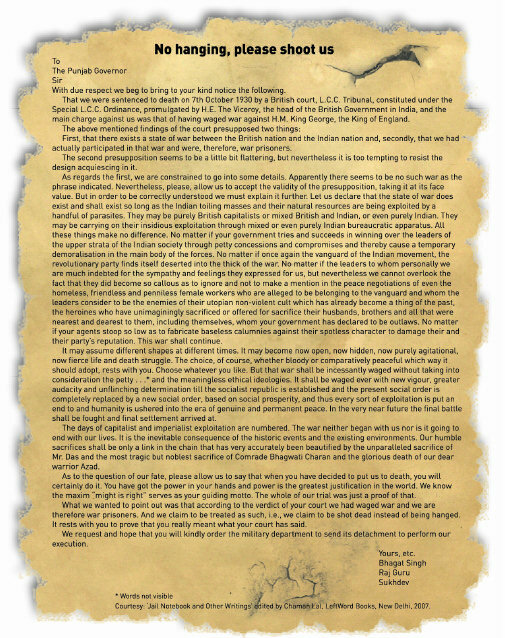 While in prison, Shaheed Bhagat Singh wrote numerous of publication including Why I am an Atheist, Following The study of Russian Revolution, He wanted alongwith Raj Guru, Sukhdev to die to give an example to indian youth to fight for their rights which britishers were exploiting at the time, Therefore They wrote a letter to Lord Irwin, Mentioning their wish to execute by shooting them not by hanging. 4 days before execution, Bhagat Singh’s Friend Prannath Mehta came to visit him with letter of Clemency but he refused to sign it and want to set an example for every emerging freedom fighters. On 23 March 1931, Bhagat Singh, Raj Guru, Sukhdev Executed and people of india prayed for their afterlife.